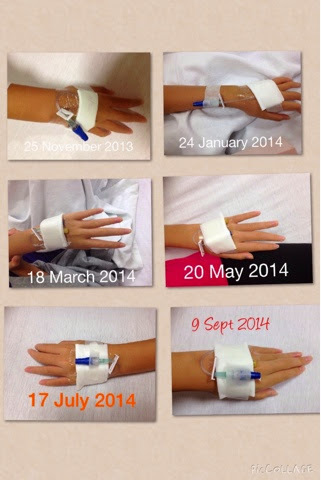 My now-not-so-little one has completed one full year of pamidronate infusions. This brave warrior has had the cannula inserted half a dozen times without squirm nor tears. Mum is so proud of you D!! Her BMD has improved, but not sufficient for her to go off it yet. As such, she will still be continuing with these infusions. Fortunately, apart from the severe abdominal pains she gets after her infusions, she has not suffered any other side effects to her kidney, liver or bladder. We have also finally managed to time her oral meds after her infusions so that her pains are managed. It appears to be a very slow process to increasing bone density. But shoulder on we will, To stronger bones!